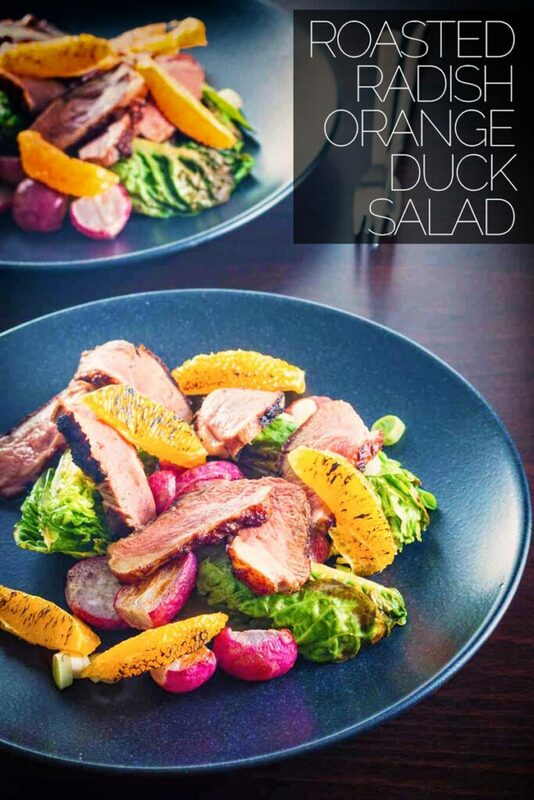 If you have not roasted radishes you definitely should start and they are perfect in this refreshing warm duck salad with orange. Warm Roasted Radish and Duck Salad. I like ‘anti salads’ and my super quick roasted radish and duck salad is exactly just that. It shares much in common with my smoked mackerel salad and Thai beef salad. Main course salad recipes with a coherent set of ingredients that all sing together. So in this salad recipe, forget limp and nasty lettuce. Think super crisp baby gem lettuce hearts seared in duck fat! Forget sharp and harsh radishes. Roast them off and get the most wonderfully mellow peppery nibbles. As for the duck in this duck salad, perfectly cooked on a stove top and really quick. I know duck can be expensive in some parts of the world but this is just one single duck breast between two so it becomes frugal… Right? This dish is a real show stopper, perfect for a date night, but also a great dinner party dish. Everything can be prepped in advance it scales beautifully. I also personally think this is the one dish that I cook that I am proud of in terms of its visual appearance. Most of what I serve on a plate I think looks like I have tossed it at the plate from the other side of the room. Although that is something I am very much working on! This on the other hand I think looks real purdy. Your wife, husband, BF, GF or guests will have no idea that you can knock it up in 20 minutes if you don’t tell them! I do love cooking with duck, it is such a fabulous meat, much more interesting than chicken. It is equally as adept at being bold enough to stand up to really strong flavours and not get lost as in my Thai red duck curry as it is being the focus of a recipe as in my duck burger. Yes, you read that correctly, a duck burger! I have received a few comments both here on social media about cooking with duck. Many people say they are very intimidated. But it really is very simple, just buy a meat thermometer and off you go. The joy of it is you can cook it on a stove top so you are not cooking blind. I’m certainly not one of those people that says meat should be cooked in a certain way. I like my meat cooked in a way that compliments a dish to my tastes and if anyone told me it was wrong I would tell them to sod off. It is my dinner and I will cook it to my taste, I encourage you to do exactly the same. 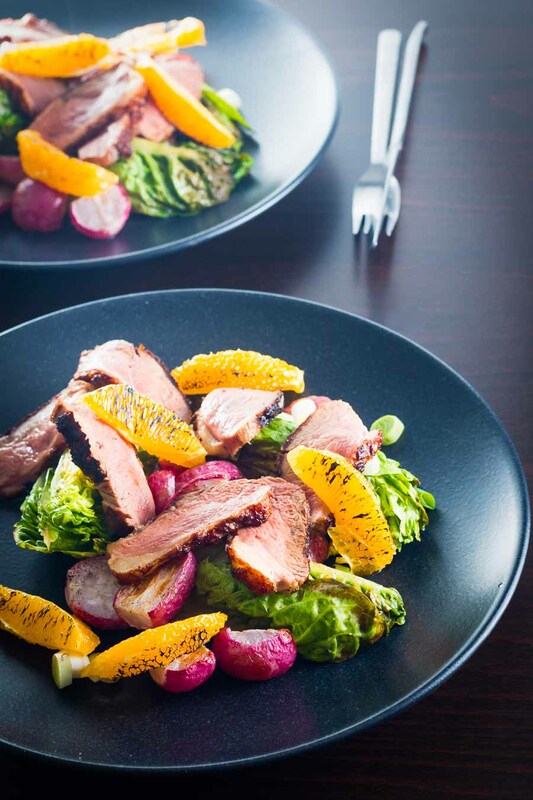 This duck breast salad represents just one of many main course salad recipes here on krumpli. For me, they are the ideal way to eat from late spring to early autumn. Regular readers will know I am a huge advocate and lover of comfort food. But when the weather breaks I like to eat lighter and fresher. I do not see any reason why that means less flavour and less fun with food though. My salad recipes are also not pious affairs about weight loss either. They are made to fulfill my love of food, nothing more and nothing less. So if you like me are a self-confessed salad dodger check out some of these main course salads with attitude! Smoked Mackerel Salad with Mango. Ham and Cheese Salad with Pickled Peaches. This recipe comes together quickly so prepare all of the ingredients before you begin. Top and tail the radish and cut in half. Cut the baby gem lettuce into quarters. Peel and cut your orange into segments. preheat your oven to 230°C. Place the radishes in a roasting tray with a good grind of pepper and a pinch of salt and 1 tablespoon of flavourless cooking oil, mix to coat and place in the preheated oven for 20 minutes. Meanwhile heat a dry frying pan over a medium high heat. Season the duck breast with salt and pepper and place in the frying pan skin side down until the skin is crispy, this should take 3-4 minutes. Then flip and cook to your liking, I like medium for this dish so cook until the internal temperature reaches 56°C before removing from the pan. This should take around 15 minutes. When cooked take out the duck and allow to rest for 5 minutes. Keep the pan with the duck fat on the heat and sear off the lettuce hearts in the duck fat. If you are a bit 'poncy' like me you may have a blow torch at home, I like to sear the edges of the orange wedges just before serving but this is optional. To bring the dish together slice the duck as thin as possible and arrange on the plate with the remaining ingredients and get stuck in. The timings on this dish are a real 'at most' figure, realistically with a little planning you can have this on the table in 20 minutes from start to finish. 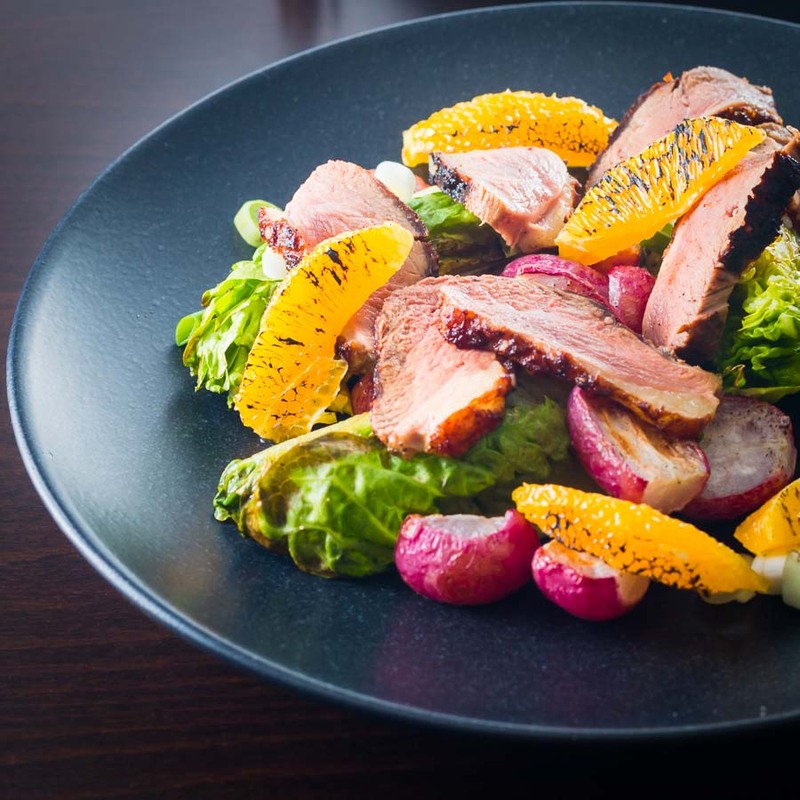 I love the seared orange segments, and thinly sliced duck – a wonderfully refreshing dish! I’m really intrigued by the lettuce tossed in duck fat, I have to give that a go! Oh yes, lettuce dressed in duck fat really is a beautiful thing! I love duck but I haven’t cooked with it much. But if this only takes 20 minutes (give or take) it’s really doable. I’m thinking this is perfect for Sunday dinner with the family. Also, I’m 100% with you on the “anti salads”, lol. Lot’s of people find duck intimidating but it really is very simple to cook, a bit more difficult to butcher and roast whole but cooking in constituent parts really is rather simple. I love warm salads and duck with orange is always a winner. Great idea too to fry off the veggies – too many salads are too cold and set your teeth on edge! I’m just going to stare at these pictures and procrastinate some more while I dream about duck salad, okay? It’s not easy to find duck in the States, and rather pricey, so it’s not something I get to enjoy frequently at home lol. I’ve only had duck once, but it was delicious. It’s probably a dish that I’ve been too afraid to cook..but I also wouldn’t even know where to begin to purchase it. Thank you, it is so difficult to judge what is available and where, Duck is available everywhere here in Hungary and really affordable, in the UK it is less widely available but still not uncommon but quite expensive. Cheers Byron… I really struggle with putting food on a plate in a purdy way so wonderful to get some good feedback. 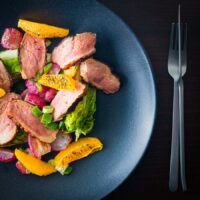 I love duck, I try not to post too many duck recipes as I know it is costly in some parts of the world but it is very affordable out here and as it is such a ‘bold’ meat a little of it goes a long way. The colors on this are just GORGEOUS, Brian!! Thanks Hillary, I love the way this dish looks add that to the fact it is really tasty then it is a winner for us. I have yet to cook with duck, but this salad looks so vibrant and delicious.. I need to try soon! Duck is such a wonderful meat to cook with, I love how it is bold enough to stand up to big flavours and retain its own flavour. I have to say, I was thinking as I initially saw this postnatal that I don’t do a lot of duck. But if this is your best dish, that alone is enough to get me to toss a duck breast into my shopping cart! 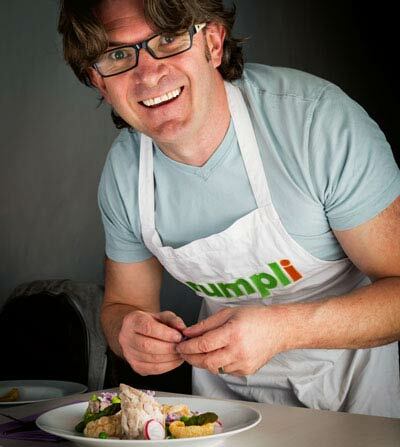 I love this dish it is bright, vibrant and fresh and so stupidly simple to make it is quite embarrassing! What a lovely salad, very simple which is a plus for me. The styling of the food makes it even more appetising, good job Brian! I love seeing radishes being featured more on blogs. I love adding them to salads, as they add so much flavour. Thanks Danii, a real early crop for us, have you tried roasting radishes? They are wonderful. Wow! 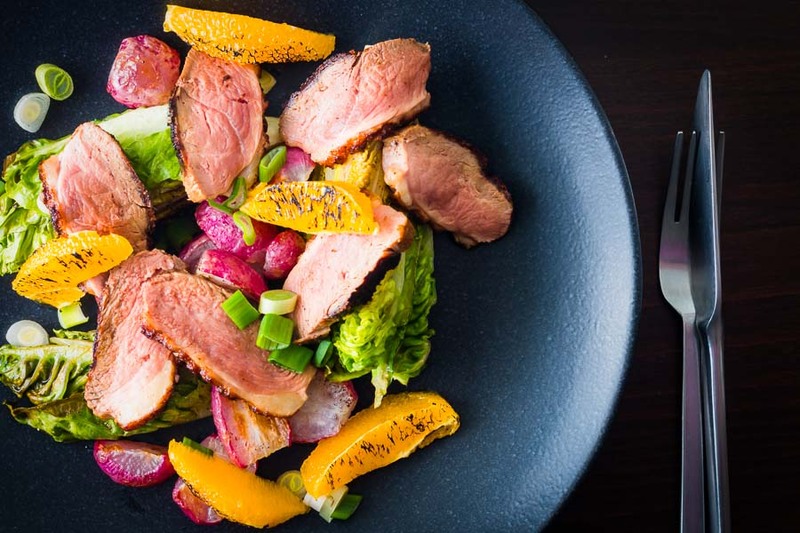 This looks incredible, duck is my absolute favourite meat protein and I love that you’ve seared the lettuce in duck fat! Everything about this just screams YUM! Need to add some duck to this week’s shop I think!